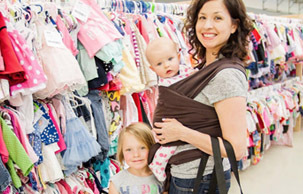 Just Between Friends is seeking energetic, motivated bargain lovers who are dedicated to serving their families and communities. We are committed to our company's core concept of bringing high quality sales events to help families shop, sell and save across the nation! This territory is currently for sale. For additional information, please contact Kendell McGowen, Franchise Recruiter, at kendellmcgowen@jbfsale.com or at 1-866-955-1792. You could own this sale! Contact Kendell McGowen at 866-955-1792. I love the fact that I can get good stuff for my baby and to sell stuff too.